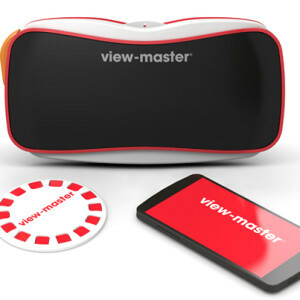 Today the news hit the tech news with fanfare—the View-Master 3D picture toy from when you were a kid is getting a first-of-its-kind virtual reality reboot this fall. The new handheld viewer, in prototype form anyway, looks not too dissimilar to the original in that’s red and plastic. But, instead of sliding in viewing disks you slide in an Android smartphone. There will will be a Mattel app available in the Google Play Store and basically it’s going to work pretty much like Cardboard, Google’s DIY virtual reality googles. Although you don’t insert a photo reel, View-Master still uses them—only now they’re called “experience reels” and you look at it as its sitting on a flat surface. When you do, the whole reel becomes the foundation of a 3D landscape you can then explore virtually. USA Today sat down with a product director from Mattel and got a preview of the product which really helped me understand how it all worked. And, Mattel has an unlisted video that helps too. If you’re in the market for an Android tablet, you may be wondering about the new Dell Venues. The reviews on it are mixed. The good: it’s gorgeous. “The Venue 8’s chassis is anodized aluminum, a material not often seen outside of Apple’s tablets…it makes the Dell feel classy…” It’s also super thin, just 6mm thick. The bad: the three rear cameras are being reviewed as basically a gimmick. Mashable says, “there are too many variables to consider, making the RealSense camera a non-starter from the get-go.” Still the overall thought seems to be it’s a worthy Android tablet. The University of Philadelphia published a first-of-its-kind study this week comparing the accuracy of fitness wearables with smartphone apps doing the same thing. The admittedly small study had 14 people walk on a treadmill for 500 and 1,500 steps—twice—and recorded their step counts. The researchers found that, for the most part, phones do just a good of a job as wearables. In fact, in many cases, phones are more accurate. Phones varied only around 7% from the observed step counts, but the wearables had a wide range—the variance was between 1.5% and up to almost 23%! (Note: Endgadget reports the Fitbit One and Zip did a great job, but the Fuelband was off in a big way). So, if you want to track your steps as a measure of being active, maybe spend your money on a new pair of walking shoes and just carry your phone :-). When you have a medical question, sometimes it can be hard to get good information off the interweb without wading through a lot of sites – some of which stink. Enter Google’s Knowledge Graph panel. They’re giving out “relevant medical facts” including typical symptoms, treatments, and how common said condition is in that panel to help you find the basics from a reputable source. They worked with medical doctors and the Mayo Clinic to make sure they got it right. Of course, this service is NOT intended as medical advice per se, but they’re hoping to “empower you in your health decisions by helping you learn more about common conditions.” It was supposed to roll out across the U.S. starting this week—have you tried it yet? Apple and Pinterest are teaming up to let you download and install apps right from pins (AKA App Pins). You’ll have to be using an iOS device to see the “install” button because it will pull up your App Store profile. The feature went live yesterday and it could help everyone discover new apps without having to sift through the App Store. Apple is also helping you find apps by introducing a “Pay Once and Play” section in the App Store. This area has apps that don’t require in-app purchases and thus is sure to be popular with kids and parents alike. Apple’s new Photos app helps Mac users store and organize their photos. Now you can use iCloud to not just share photos, you can also store all your photos there. You can put the full-sized image on the cloud, and store smaller resolution versions on your computer/mobile devices. Photos also imports both JPG and RAW photo files, but it still lets you edit them too. The Verge has a comprehensive piece about all the updates, if you’re interested. The travel website world keeps getting smaller. First Expedia bought Travelocity, and now they’re buying Orbitz. It’s long been an issue, but there was never a solution—what do you do with a Facebook page after the owner dies? Facebook used to automatically freeze pages when they knew the owner had died, but that didn’t always sit well with that person’s family and friends. In an answer to that problem, Facebook is introducing the ability to designate a “legacy contact” who can have enough access to the page to turn the Facebook page into a sort of digital memorial to the deceased. Sure, it may sound morbid, but important to think about. Setting a legacy contact is completely optional. To do so, go to Settings, then Security, and then Legacy Contact. Note: Gmail has had a similar feature since 2013 (I didn’t realize they did until this week!). You can set an “inactive account manager” and select how much access they can have if you stop using Gmail, cloud storage, or other services for a month. It’s 14:15 minutes long, but if you’re a Harry Potter fan, you’ll want to watch this tragic master cut from all the films. The creator pulled together all of the key Snape scenes from the movies…but in chronological order. The video starts with Severus and Lilly as children and it’s really quite powerful…and quite sad. Have tissues handy if you’re a crier.